HOME! Staying in a cottage "La Avutarda" means enjoying the past and the present at the same time. This accommodation is a small tribute to the beloved figure of "Los Abuelos", who wisely and with very few resources, took their lives and their families forward. For this reason the house retains its traditional construction of stone, wood and adobe ... reflection of the previous: "The Sobrao" developed in an open deva of 100m, where before the grain was stored and is now an area with extra beds and "Hammocks", which hang from the beams and where, only in summer, you can enjoy the "Siesta" .Thanks to the traditional materials used in its construction the house maintains a very pleasant temperature both in winter, and in a very special way in summer, when the phenomenon of the "Fresquito" is perceived, which is the sensation that the person enjoys, when doing outside, in July-August, a lot of heat, when entering the house there is a sudden temperature change, which It takes you to think and say: "Oh how cool is that ..."this is unique.EQUIPMENT! The Bustard is sparse in decoration and equipment, however it is ideal for short stays, a day or a weekend or more durable. It has everything you need and the customer just has to enjoy how much he hides. The goal is to get the traveler to feel at home throughout their stay. That is why he has fled from everything that could distort the charm of a town house in sober Castile. 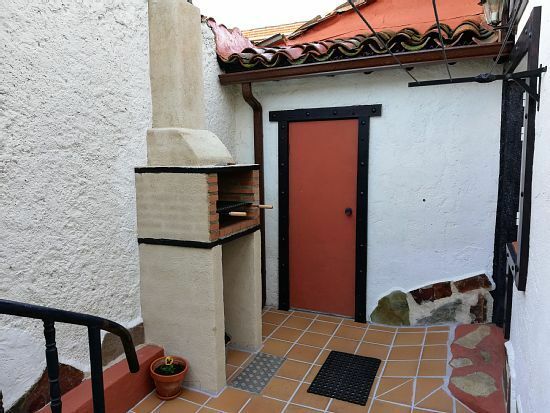 The house is spacious with a total of 120m + 100m devan, with capacity for 9 people, with an interior patio and a wooden Castilian Corral that serves as a garage for 1 car + grass area with barbecues (another 60m).LOCATION! Villoria, where this accommodation is located, province of Salamanca, is the most important town, in terms of population (1500 inhabitants) and public facilities, throughout the area, 20 minutes from Salamanca capital. The house will not disappoint you, the town less since it has everything before any eventuality: 24h medical center, pharmacy, soccer fields, football, pavilion, municipal swimming pools, SPA, children's recreational areas. Youth nightlife venues, tobacconist, kiosks, bic church, mountain, green areas, hairdressers, Civil Guard barracks, Taxi, public buses and very well connected by road, gas station ...INTEGRAL RENTAL OR ROOMS! The whole house is usually rented, but on the same day or the previous day it is also possible to rent a room. without mixing clients who do not know each other. WEB: laavutarda. com we have a blog with a lot of articles and proposals on for example: -book of visits-online sales -organization of events -ingles ... etc. The house has a garage with shelter suitable for pets. Located in a quiet area that will give security to families with children. Although the house does not have a spa, in villoria there is a physiotherapy clinic that offers a professional spa and massage among other things. Although we do not have rooms or services adapted for the handicapped, it can be added that all our doors have a considerable width and sufficient for the mobility of this type of clients, just as the whole house is located at street level without problems of stairs or level changes. Un casa ideal para ir en grupo o en familia. El propietario nos oriento muy bien para poder hacer una escapada a Salamanca. Una casa muy acogedora y silenciosa por la noche para dormir muy bien. Un pueblo con buen ambiente para tomar una tapas el sábado por la tarde. Una casa recomendable a 20 minutos de Salamanca en coche. De las que más me han gustado este año. Sentirte como en tu casa y ver la maravilla de ciudad,salamanca. Este fin de semana por fin nos decidimos a visitar Salamanca,que ciudad tan bonita y en "La Avutarda" nos alojamos,todo un acierto,eramos 2 parejas con niños,8 personas...te sientes en tu casa desde el principio.El trato de Josue,el dueño,muy atento informandonos de posibles actividades.Salamanca es preciosa pero al ir con niños tienes que entretenerlos,y en casa con el internet fue de gran ayuda...por la noche salimos todos,excepto el perrito a una fiesta de carnaval en los pubs del puebo,que por cierto el pueblo esta a la altura.El domingo en la mañana hicimos una ruta a caballo por el rio Tormes,cerca del pueblo. Se la recomiendo a todos los madrileños.